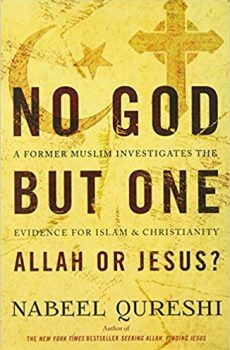 Nabeel Qureshi, No God but One: Allah or Jesus? A Former Muslim Investigates the Evidence for Islam and Christianity. Grand Rapids: Zondervan, 2016. 320 pp. $17.99, paper. Stories of converts from Islam to Christianity are plentiful. Indeed, according to some reports unprecedented numbers of Muslims are coming to Christ across the world. Notably less common, however, are testimonies of former Muslims that ascribe a significant role to Christian apologetics. Nabeel Qureshi represents one such case—perhaps the best-known case given the success of his first book, Seeking Allah, Finding Jesus, in which he recounted his personal journey from Islam (specifically the Ahmadi tradition) to Christianity. His conversion was driven not only by increasing unease with traditional Islamic teachings but also by historical arguments against major Islamic claims. A significant component of Qureshi’s story involves his friendship with David Wood and his encounters with Christian apologists Gary Habermas and Michael Licona, whose arguments eventually persuaded him that Jesus’ crucifixion and resurrection were historical events. Qureshi’s first book served as an apologetic as well as a testimony, but it didn’t directly and systematically address the historical and theological issues at stake between Christianity and Islam. Qureshi’s most recent book, No God but One, does precisely that. As Qureshi puts it, his first book reflects “the heart” of his story, while this one represents “the mind” of his story. His stated goal is to defend two basic theses: “that the differences between Islam and Christianity have great implications, and that the evidence of history strongly supports the Christian claims” (13). The wording of his second thesis already hints at the methodology he adopts for establishing the truth of Christianity. The book is thus structured into two halves addressing two crucial questions: (1) What are the differences between Islam and Christianity? (2) Can we know whether Islam or Christianity is true? The second question somewhat understates Qureshi’s goal, which is not merely to argue that we can know whether one of the two religions is true, but that examining the historical evidence shows us precisely which one is true. Each half of the book is further divided into five parts, and each of these into four short chapters, resulting in a book with 40 easily digestible chapters. In the remainder of this review, I will briefly summarize the main issues addressed in the book before offering an assessment of its content and approach to those issues. Part 1 (“Sharia or the Gospel?”) contrasts the Islamic and Christian views of salvation: law-keeping versus grace-receiving. The two faiths present very different diagnoses of the human condition, and thus offer very different solutions. To put matters bluntly: Islam teaches that we can (and must) save ourselves, whereas Christianity teaches that only God can save us. Part 2 (“Tawhid or the Trinity?”) examines the different views of God represented by each faith. 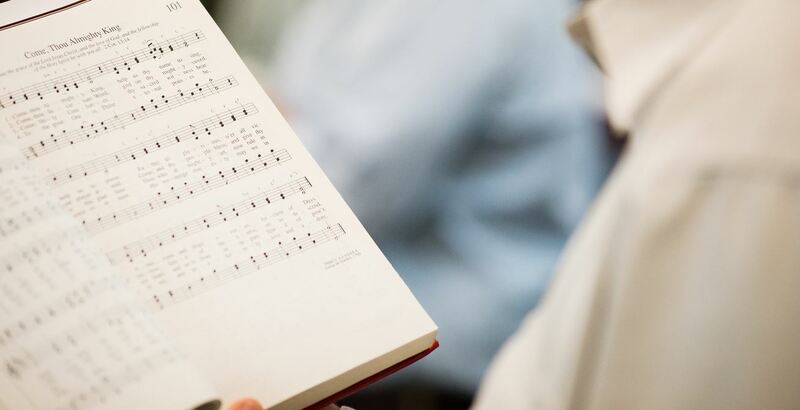 While both are monotheistic—each can affirm the biblical shema—the God of the Quran is “a monad” with no internal interpersonal relations (the Quran states emphatically that Allah has no son) but the God of the New Testament is triune. The last of these four chapters raises the vexed question of whether Muslims and Christians “worship the same God.” Readers in search of an unambiguous answer to the question will not find one here (although to be fair, that’s partly because the question itself is ambiguous and thus susceptible to different answers depending on how it is interpreted). Nevertheless, we are left in no doubt that the Islamic and Christian views of God are diametrically opposed at significant points. The two religions cannot be reconciled. Part 3 (“Muhammad or Jesus?”) contrasts the two founders of Islam and Christianity, although much of the material focuses on Muhammad’s view of Jesus (a merely human prophet) versus Jesus’s own view of himself (the incarnate Son of God). Along the way, Qureshi seeks to defuse some of the common objections Muslims have raised against the doctrine of the Incarnation. Part 4 (“The Quran or the Bible?”) compares the two holy books of Islam and Christianity, laying out not only the major differences between the Islamic and Christian understandings of divine inspiration but also traditional Muslim views on the corruption of the Bible. Qureshi closes this section of the book with a personal testimony of how the Bible penetrated his heart in a way that the Quran never did, speaking words of deep comfort in a time of sorrow. Part 5 (“Jihad or the Crusades?”) surveys “two different holy wars”: the wars of Islamic jihad and the wars of the Christian crusades. The material here is basically a condensation of Qureshi’s 2016 book Answering Jihad. Without attempting to exculpate the Crusaders—atrocities were committed by armies on both sides—Qureshi argues that their actions need to be understood in their historical context as, at least initially, a justified defensive reaction to “the Muslim conquest of fully two-thirds of the Christian world” (quoting Thomas Madden). More importantly, he contends, the Crusaders were not following the example of Christ in the way that the Muslim conquerors were seeking to follow the example of Muhammad. Having established these fundamental points of difference between Christianity and Islam, Qureshi proceeds in the second half of the book to focus on the question of truth. While the two faiths could both be false, they cannot both be true: “The central claims of Christianity are explicitly rejected by Islam. Islamic doctrine is antithetical to the core message of Christianity.” (154, author’s emphasis) Thus, if the central teachings of Christianity are vindicated, Islam is falsified—and vice versa. These questions are dealt with in parts 6 through 10 of the book, each consisting of four chapters: the first laying out the “positive case” made by Christians (questions 1 through 3) or by Muslims (questions 4 and 5), the second summarizing the typical response by the other side to the positive case, the third assessing that response, and the fourth drawing an overall conclusion in answer to the original question. Qureshi’s conclusions will surprise no one, but he does lay out the arguments in a responsible fashion, showing that Christianity stands on firm historical ground in a way that Islam simply does not. Readers familiar with Christian-Muslim apologetics will not find much new or surprising in these chapters, but Qureshi does a fine job of cutting through tangential issues to get to the heart of the debate. Any Muslim who has yet to engage in a serious study of the historical origins of Christianity and Islam will find enough material to dislodge his unexamined assumptions. There is much to admire about this book, and I expect it will have a significant positive impact. Given his personal story of coming to faith in Christ, Qureshi possesses a credibility that few Christian apologists can match. The book is well arranged, with a clear logical structure, and written in a respectful, conversational style with plenty of engaging illustrations and anecdotes. In my view, Qureshi succeeds in his main goals of demonstrating the fundamental opposition between Christianity and Islam, and exposing the glaring disparity between the two with respect to historical credentials. While I can recommend it as a useful resource, I must also register several serious reservations. In the first place, there are some theological concerns. In the chapter on grace, Qureshi suggests that “Muslims and Christians do not disagree on much” when it comes to human sinfulness, since both basically agree that everyone sins and that sin invites divine judgment. Qureshi notes that Islam lacks Christianity’s doctrine of original sin, but implies that this is a secondary issue; furthermore, he forwards the view that Adam’s progeny inherit only his corruption and not his guilt, such that we bear guilt only for the sins we ourselves have committed. Reformed readers will no doubt find this troublesome, along with the later (perhaps inadvertent) implication that Christ in his death bore merely “the consequence of our sins.” The notion of imputation, whether in Adam’s fall or in Christ’s atonement, is absent from Qureshi’s account of sin and salvation. Another concern pertains to Qureshi’s defense of the deity of Christ. The arguments he offers are unobjectionable for the most part, but he shares in the practice—common in popular evangelical apologetics—of expressing the Christian doctrine simply as “Jesus is God.” If that statement is taken as a loose way of affirming the fully deity of Christ (the Nicene homoousios) then, of course, it’s a true and orthodox statement. However, its imprecision can easily invite modalistic distortions of the doctrine of the Trinity, which serve to aggravate Muslim confusions rather than alleviate them. In the context of engaging Muslims it would be safer to characterize the Christian view as “Jesus is the divine Son of God,” or something similar. That would still present a direct challenge to the Quran’s denials, while more closely tracking Christ’s self-descriptions and the language of the New Testament generally. Turning to matters of methodology, Qureshi’s evidentialist approach also invites criticism at points. He apparently holds that conflicting truth-claims between worldviews can be settled by examining historical evidences, presumably from some sort of worldview-neutral standpoint. But this is misguided: there is no worldview-neutral approach to historical investigation, and how one interprets and weighs evidences will depend on one’s presuppositions (i.e., worldview). This is not to suggest that historical evidences are impotent or unimportant when it comes to worldview-level disputes, but only that we must recognize the two-way relationship between worldviews and the evidences we take to support them. Furthermore, Qureshi repeatedly suggests that Christians and Muslims should approach the historical questions raised in the book as “objective observers” and “objective investigators” (151, 157, 174-176, 181-182, 194-195, 209, 214, etc.). If this is meant only as a plea to set aside personal feelings, cultural prejudices, and the like, then all well and good. But I suspect it is intended more strongly as an invitation to take a worldview-neutral or worldview-indifferent stance with respect to the evidence. (Tellingly, Qureshi remarks in a footnote that “an objective observer must allow for the existence of God without asserting it”—in other words, adopt a neutral stance with respect to God’s existence.) This ideal of objectivity is not only epistemologically and psychologically naïve, but also theologically misguided given what Scripture teaches about the noetic effects of sin. It’s understandable that a Muslim led to Christ through an evidentialist apologetic would adopt the same approach in his own ministry to Muslims, but the fact that God can draw straight lines with crooked sticks doesn’t legitimize crooked sticks. This minimalist approach has become a common if not ubiquitous theme in contemporary evangelical evidentialist apologetics: we must set aside the inspiration (never mind the inerrancy) of the Bible as a non-essential secondary doctrine, treating the New Testament merely as a collection of generally reliable historical documents, and on that basis argue that (very probably) Jesus claimed to be the Son of God, was crucified, buried, and rose again. If we can show that much, we can claim victory. Despite these shortcomings, Qureshi’s book is undoubtedly one of the better resources available today for apologetics to Muslims. Christian readers will find it most valuable as it makes clear the foundational differences between Christianity and Islam, boosts their confidence in the historical foundations of their faith, and provides them with useful material for engaging in discussions with Muslims. No God but One ends on a sobering note as it concludes the moving story introduced in the book’s prologue: the story of Sara Fatima, a young Saudi woman who was brutally murdered by her brother following her conversion to Christ in 2008. As Qureshi observes, “Leaving Islam can cost you everything: family, friends, job, everything you have ever known, and maybe even life itself. Is it really worth sacrificing everything for the truth?” The author himself has suffered painful losses because of his conversion (and I suspect his life has also been threatened). Even so, he presses upon the reader his conviction that any earthly suffering or sacrifice is worth the eternal peace and joy of knowing Christ and the power of his resurrection (cf. Phil. 3:7-11).